Senior Online Personals is an online dating site for singles over 50 (and under 99). Sorry, but if you are over 99, you will have to find love somewhere else. Fun site with lots of features. Definitely worth a look (or two). Niche dating has exploded online, providing sites that are exclusively focused on one particular group of people (and the people who are interested in that group). 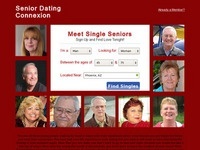 If you are interested in the Senior community, Senior Dating Connexion is the site for you. It only takes minutes to create a free account, and then you are free to check out the singles who have also been drawn to this site. You can't meet someone just by looking at the homepage, so join...and start having fun! 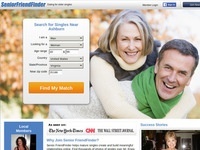 Dating Senior Singles - Find New Love! Dating Senior Singles is for single men & women over 50, and those that love them. Join for free and browse through profiles of people just like you...or maybe even a little cuter. It's really pretty straightforward. Single, divorded or widowed Seniors who are looking for friendship (or more). The key to a good senior dating site is to have a large number of members over the age of 55, who are interested in dating. 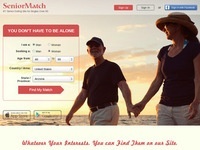 Senior Match is one of the largest online sites focused on seniors, so it is definitely worth a look. As part of the (very large) People Meet network, Senior People Meet is designed specifically for Seniors. If you are looking to meet other singles over 50, it only takes a few minutes to join for free and check out all the fun features available. 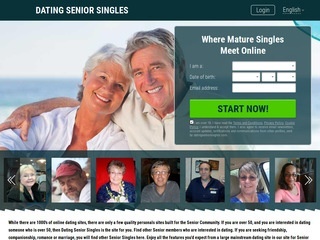 Senior Passions is a free dating site for Senior Singles. Join for free & take advantage of free email, free Senior chat, forums & more. "Senior Friendfinder is the most popular place for people over 50 looking to meet others for romance, dating, friendship and more!" Mature RSVP is a singles site for members 40 and up, so whether you are a Babyboomer or a Senior, this is a site worth checking out. While the primary site is UK focused, they do have options for the U.S., Australia and New Zealand. Intersted? Take a look!"